Elizabeth and Elisha Somerville have been gaining fans at the South of the James Market this year with their homesteader herbal salve, Trailblazer Jewelweed Liniment (great for poison ivy!) and other natural skincare products. 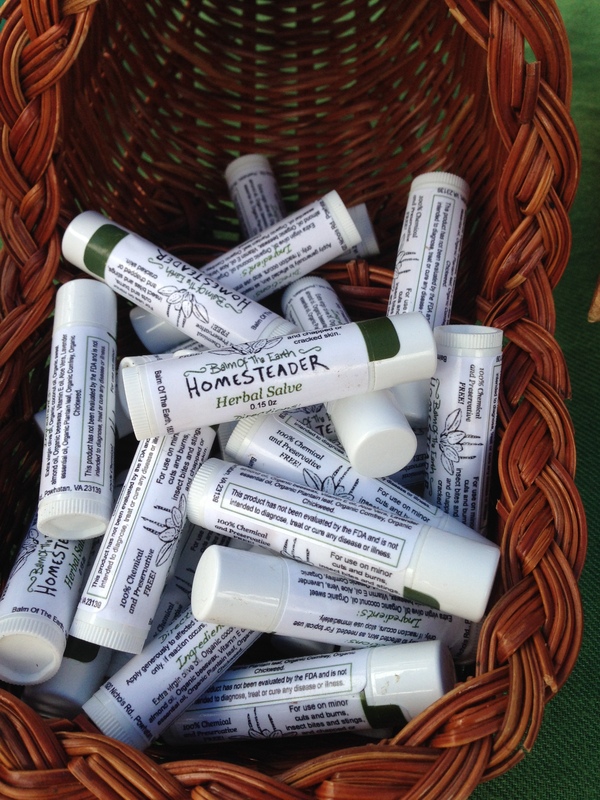 Read on for a little insight into how and why these savvy homesteaders created their company, Balm of the Earth. 1. When and how did you get started? – The inspiration for Balm of the Earth, which was started in August of 2012, stemmed from the scary realization of the amount of toxic chemicals found in most skin care products. At the time, we were expecting our first child, and we couldn’t stand the thought of putting conventional skin care products on his skin. This led to experimenting with many different recipes, until we made a moisturizer that we were SO satisfied with that we couldn’t keep it to ourselves! This was just the beginning of many all natural skin care solutions and of our career as a small business family. 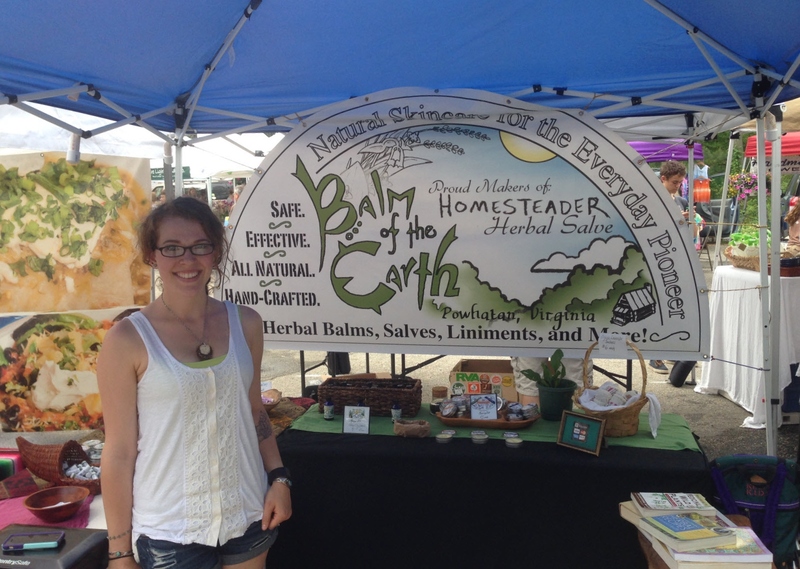 – Balm of the Earth currently attends 4 different farmers markets in the central Virginia region. When we are not vending at one of these markets, we spend our time farming and gardening, foraging wild, edible and medicinal herbs, making product, and hiking, all together as a family. Our toddler is always with us, learning about everything along the way! 3. Describe the process involved with creating one of your products. 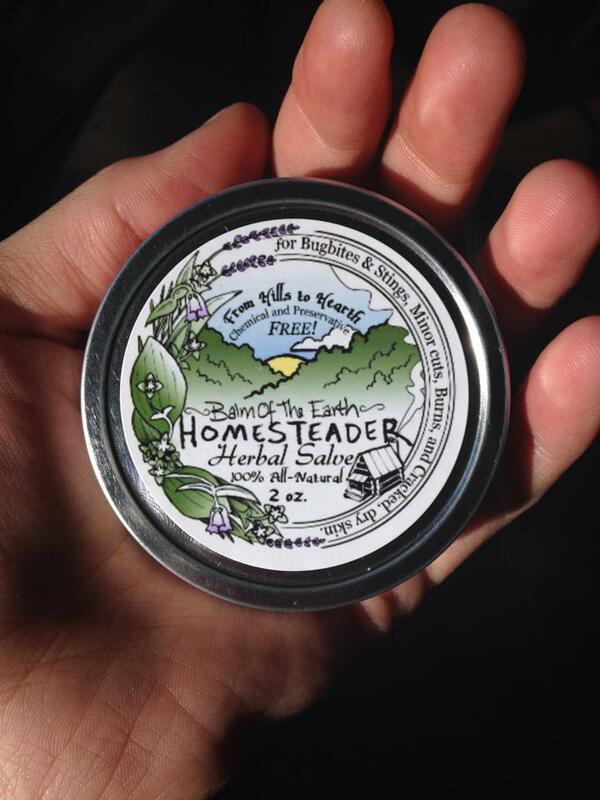 – Homesteader Herbal Salve, Balm of the Earth’s best-selling product, involves a long, yet simple, process. We start by infusing Extra Virgin Olive oil and Virgin Coconut oil with dried Plantain leaf, Comfrey leaf, Calendula, Echinacea, and Chickweed. We let the oils infuse for a minimum of 24 hours, after which the oil in strained and measured into another jar, along with a specific ratio of organic beeswax. The oils and beeswax are then heated until they are liquid, at which point we add Lavender essential oil and Vitamin E oil, give it all a stir, and then pour the liquid salve into our tins and tubes. As the salve cools, it solidifies, and is then packaged and ready for the market! 4. What three words would you use to describe your products? – Safe, pure, and effective. 5. Where do you get your ingredients? – All of the oils that we use in our base ingredients in various recipes are food grade, organic, cold-pressed (from the first pressing), unrefined, and either extra virgin or virgin, where applicable. We buy most of our ingredients online, through smaller (usually family owned) companies, and are making conscious efforts to source our ingredients as locally/fair trade as possible. The strict standards that we hold ourselves to ensures that the ingredients in our products are the highest quality, most pure oils that the world has to offer, following our philosophy that one should only put on their skin what would be pure enough to consume.